Football is still a popular youth sport across Ontario, but growing concern over the risk of serious brain injury is leading some parents to steer away from signing their kids up. Enter TackleBar. Football is still a popular youth sport across Ontario, but growing concern over the risk of serious brain injury is leading some parents to steer away from signing their kids up. 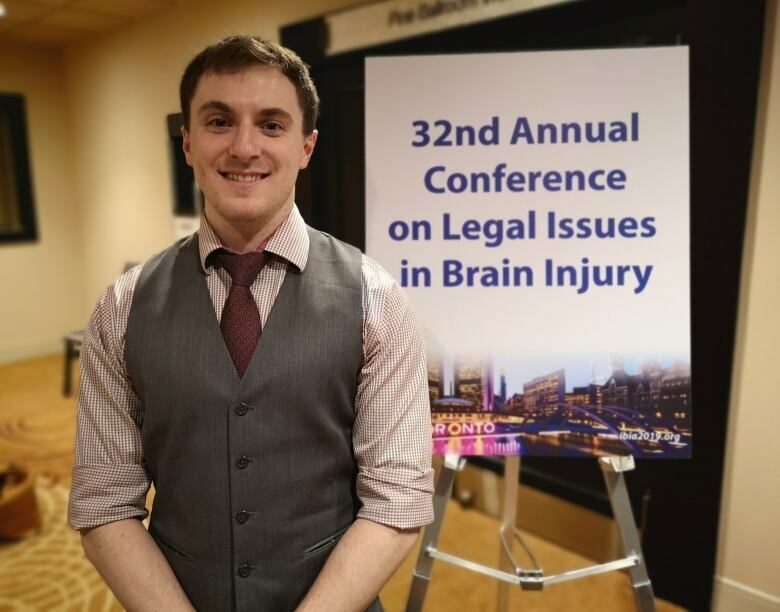 The new alternative to traditional and flag football, which was created in the U.S. and is now catching on with the Mississauga Football League and some Canadian high school teams, was in the spotlight at the 13th World Congress on Brain Injury in Toronto this week. "TackleBar is kind of a mediary between flag football and tackle football," said Joseph Toninato, a research assistant from Minneapolis Medical Research Foundation who has been studying the new sport's ability to cut down on injuries. 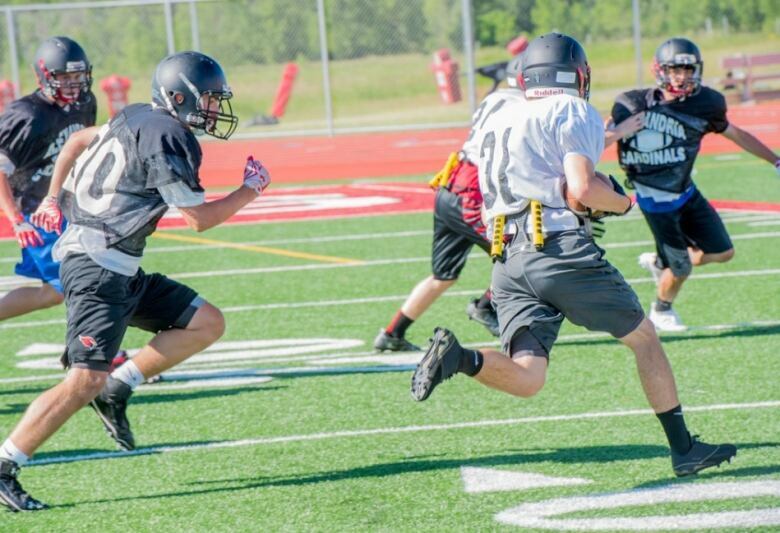 Players still wear helmets and shoulder pads, but take a different approach to tackling. 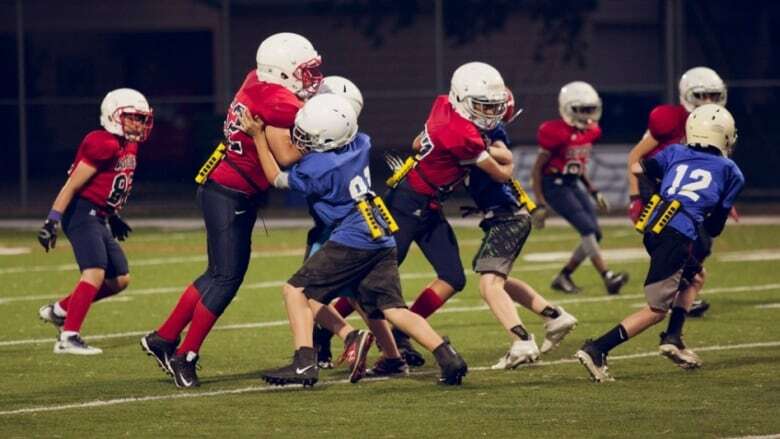 "The tackler will wrap up the ball carrier like they were going for a normal tackle, but instead of throwing them to the ground, they would just remove the bars," he said, showing the two removable foam pads attached to a player's lower back with a special harness. So is it safer than football? Toninato and his fellow researchers found that in about 17,000 athletic exposures among youth, there were zero incidents of concussion, and only five reported injuries. That equates to 0.3 injuries per 1,000 exposures, a rate Toninato calls "significantly" low. Surprisingly, his team found flag football had the highest rate of injury, with 5.7 injuries per 1,000 athletic exposures. Traditional football, meanwhile, saw about 2.2 injuries per 1,000 exposures. "We believe the high rate is due to lack of equipment in flag football. There is supposed to be no contact so (players) don't learn how to take a hit," Toninato said. Despite those results, there are skeptics who question why there is a need for youth to participate in heavy-contact collision sports at all. "It feels like they are dancing around the issue," said Dr. Paul Echlin, of the Elliott Sports Medicine Clinic in Burlington. "You have to stop children — and adults — from hitting hard, and on a repetitive basis. That's the root cause of traumatic brain injury,"
As a primary care sports medicine specialist, Echlin has seen firsthand the damage concussions can cause. He says most brain injuries go undetected, or occur at the "sub-threshold level," something which would make the rate of injury far higher if factored in. "Why are you going to have 9-year-olds helmeted up if you aren't going to have any collisions or contact?" he said. TackleBar was founded by Minnesota entrepreneurs Jeremy and Brigid Ling, parents who wanted an option for their kids — most players ranger range in age from eight to 11. Since its launch three years ago, the sport, sometimes dubbed "fusion" football, is now being played in youth football leagues in 21 states. By removing the need to tackle a player to the ground, but encouraging proper tackling technique, proponents of TackleBar say it maintains the spirit of the sport, decreases the risk of concussion and prepares young players for traditional football. While it doesn't eliminate possible hits to the neck and head, as Echlin notes, Toninato still sees the value in TackleBar. "Eliminating one of the largest sports for youth is not a good idea," he said. "I think that will be a detriment to future generations. But I do think having some system like TackleBar to try to eliminate those injuries is just as important."